One problem in running Google searches on “Corinth” is the unwieldy number of hits returned. The reason for the numerous false positives is that the USA has a good number of cities and churches named “Corinth”. On the first two pages of a Google search, one encounters sites related to Corinth Mississippi, Corinth Vermont, the Battle of Corinth (American Civil War), Corinth Texas, Corinth New York. Nothing wrong with these places, of course, but someone looking for ancient Corinth, Greece, may not be interested in the American stops along the way. Filters help. In my Google Alert subscription on “Corinth,” the following filter eliminates a lot of the background noise: “-tx -Texas -Mississippi -miss* -ny -ms -york -ave -avenue -download -lovis -boots -maine -vermont -killzone”. (If you didn’t know, Killzone is a videogame; Lovis Corinth was a German painter; and UGG Australia produces a brand of women’s “Corinth boots”). But the filter is still not precise enough to keep out irrelevant material. I have found in my inbox stories about murders and deaths in the various Corinths of the United States; the Coca-Cola race in Corinth, Mississippi; and interracial dating in Corinth, Kentucky. This morning’s alerts turn up pages on spinal surgery, astrology, and the Battle of Corinth in 1862. An unpublished 1890 manuscript by Elihu Baxter was discovered in the retirement community of Sun City Center, Florida in May 2010. In it, Boston blueblood Baxter describes how he and his best friend, Robert Fontaine, were guided by the Spirit of Adventure, a drunken prospector and the lust for gold, to the small California mining town of Korinth in 1872. For nearly two years the residents of Korinth got rich digging the treasure from the Earth. The future looked as bright and shiny as a gold nugget until Edna McCauley, a woman with a singing voice so dreadful it was rumored that President Lincoln had wanted to unleash her on the Confederacy if Robert E. Lee refused to surrender, is murdered at a church social. Her killer was Evangeline O’Meara. Murder was a hanging offense in the Old West. The trouble was, Evangeline O’Meara had already been hanged the week before for the murder of her husband, George. 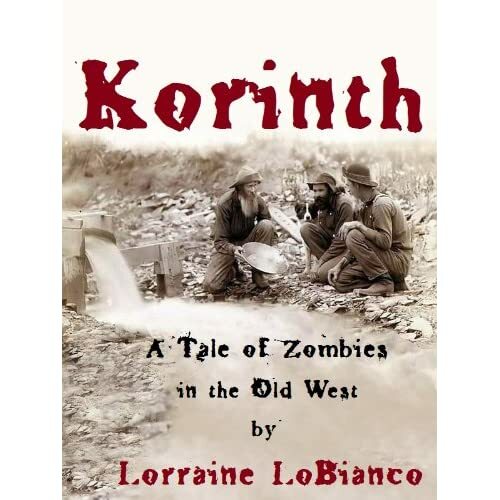 Interestingly, there appears to be no actual settlement in California known by the name “Korinth.” Why, then, did the author choose this name as the fitting scene for a story of horror and the undead? I have purchased this important work and will report back. Okay, so I read said book (it’s not too long) and it was pretty good. Of course, I like zombies and westerns, so I was predisposed to like it. No idea why “Korinth,” and why with a “K”? I’ll have to ask. Ha. That’s great. Nothing in the book that would trigger Korinth? I can think of only a handful of stories of Corinthian undead: a ghost story told by Lucian, I think, and the story of the lamia told by Philostratus. Surely that’s not the inspiration. I honestly have no idea where the name Korinth (with a “K”) came from. I could lie and say I was inspired by Lucian, but the only Lucian I know is my friends’ 2 year old. He inspires train stories, not zombies, although if he doesn’t let his parents get a little more sleep, they may become zombies. I knew about Corinthian leather from my grandfather’s 1970s cars and the beautiful town, obviously, but Korinth with a K…I honestly don’t know where it came from. It just sounded good when I said it out loud. And I googled it and there doesn’t seem to have been a town called Korinth. I don’t even know if anyone uses it for a last name like my three characters. Thank you, Richard, for your kind words! They are much appreciated! Thanks for the reply, Lorraine! This clears up one mystery at least. There are Corinth, Americas, everywhere, but the K-Korinth spelling is rare outside of Greece which is what started me wondering. I’m working on a little blog post about American Corinths and can scratch this one off the list of directly inspired naming.